Southampton’s manager, Lawrie McMenemy was spotted behind the main stand after the match with his head in his hands. He wasn’t even angry that his team had managed to throw away a 4-0 first leg lead. He was simply shellshocked. Graham Taylor admired McMenemy and later asked him to be part of the England management set-up. When McMenemy had been Grimsby manager he took the players to the fisheries and introduced them to the workers and tried to drum up support. It sparked in Taylor the idea to make Watford an integral part of the local community. Watford had been horribly exposed at The Dell. They weren’t just beaten, they were swatted aside with ease. But Taylor refused to give up. He told his team they were to treat the tie as if it was a league game. They’d lost away but they could still get three points from the home game. Taylor was simply trying to get something worthwhile out of the match because all hope of reaching the third round had gone. In football, you can never give up hope. If you don’t believe in the impossible, what’s the point in playing? Perhaps if Watford could get one goal they could get two. If they could get two maybe they could score a third. And if that happened, Southampton might begin to panic. Crazy talk. It was absolute madness to think a miracle was on the cards? So why did Taylor, when asked by a young fan on the morning of the match what the score would be, reply, 7-1? The manager’s programme notes were upbeat. He promised his team would have a go. They did more than that. Much more. Thinking the tie was dead, the Saints rested a few players. Kevin Keegan did not play. It was only after the game that it emerged that he had picked up a knock during Saturday’s match. Was he really injured or did it just make sense to say he was rather than admit they’d rested their best player? Watford set about their task with a sense of purpose. Ten minutes passed before Malcolm Poskett got the first. Ten minutes before half-time Ray Train fired a second. They were halfway there but still had no right to get back into the tie. All Southampton had to do was shut up shop for the second 45 minutes. But Martin Patching got a third and suddenly Watford were in business. Disaster struck at the other end when the ball bounced off Steve Sims and went in. It was back to square one. A brave fight had been stopped in its tracks. However, within a minute, Watford had made it 4-1. They were given a penalty and Ian Bolton blasted it home. Seven minutes from time, Ross Jenkins scored a fifth, which was enough to force extra-time. By now, word had spread and people were arriving at Vicarage Road so they could say they had witnessed it. The teenage substitute Nigel Callaghan scored a superb goal with his first touch of the game and Poskett rounded it off with his second goal. Seven-one. Could the Watford fans believe what they had seen? It set the tone for a decade when it seemed nothing was impossible. 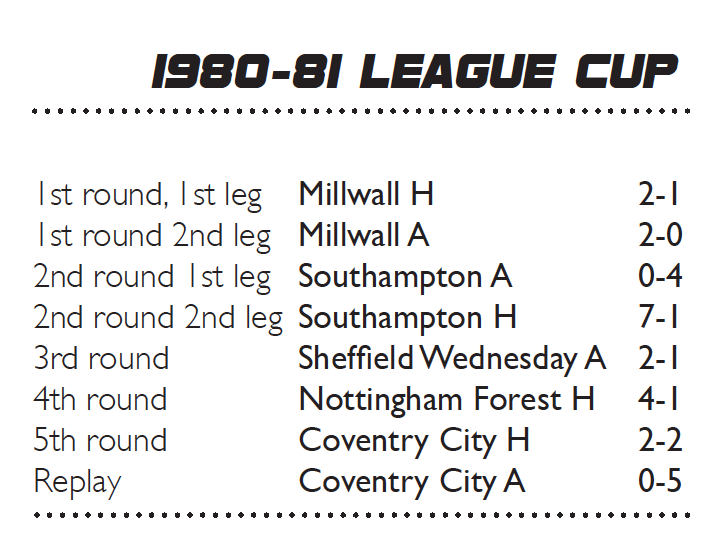 Watford’s cup upsets and great strides forward in the league led to much debate about their style of play. Speaking to the BBC’s John Motson, Graham Taylor was clear. Taylor: We keep getting asked this about the style of play. I don’t really know what the style of play is. What we do is we want to go forward and we want to get the ball in the box as often as possible. If you say to me will I change my attitude and approach to the game I will say quite emphatically ‘no’. As regards our style, I’ll leave it to the experts to decide what style we play. We’ve been described in certain quarters as a kick and rush side. I find that quite amazing that people in the game say we’re just a kick and rush side. If it is as simple as that then I think everyone ought to kick and rush it but you know as well as I do, John, that it’s not as simple as that. Motson: But it may be more sophisticated in the First Division is the point I am making. Taylor: More sophisticated? I hate that word being used where football is concerned. Football is a simple game. It is not a sophisticated game. It’s a game for the man on the terraces. It’s a game to excite the people. I know that the man on the terrace when he sees something that creates excitement, and that is usually in and around the penalty box, will take great interest. He is not interested, in my opinion, in watching people play 15 or 16 consecutive passes in their own half.